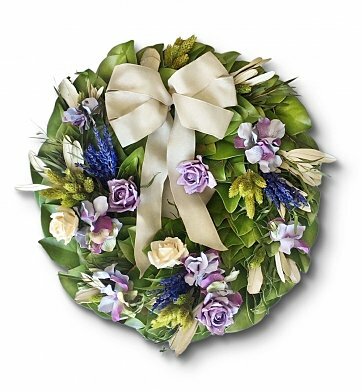 Set the stage for spring with this luscious, festive wreath adorned with lush, shiny Magnolia leaves, scented lavender sprigs, light purple roses, eucalyptus and more. Accented with a cream bow it's a perfect offering for Mother's Day and beyond. One Magnolia Lavender and Roses Wreath. Wreath Measures 18" in Diameter. if ordered by 10:00 am EDT Monday April 22nd. Lavender and Roses Wreath is a hand delivered gift. These gifts are delivered by one of our local design centers located throughout the United States and Canada. Same day delivery is available for most gifts when ordered before the cutoff time. The cutoff time for Lavender and Roses Wreath is 7 AM in the recipient's time zone. Scented lavender sprigs, roses and eucalyptus over magnolia leaves. Accented with a cream bow, measures 18 inches in diameter.